I wonder if one can host template images on blogger itself. 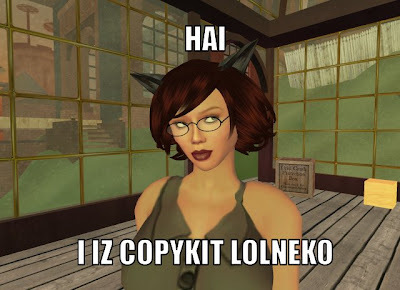 Everyone knows about lolcats and icanhascheezburger, don't they? I'm a copyKit because I'd been meaning to do a lolneko picture for some time and only got around to doing it after shameless red headed hussy Kit Meredith did it in this blog post upon her return to blogging again. Why ImageMagick doesn't get more press on the SL blogs is beyond me, it's just so useful. House of Zen has a nice sleeveless "career woman" dress for sale. Everyone knows I like tailored things so I picked it up. It's more of a summer dress, being sleeveless. The sort of thing you'd want to wear a jacket with at the boardroom while doing the presentation, but without a jacket back in your workspace. Problem is, it doesn't come with one. I'd LOVE to have a matching jacket. I paired the dress with my new Stacked pumps from Shiny things, the classic Fleur "Heiress" bag, Maaliyah hair from ETD, and neko ears/tail. I was in a neko mood at the time because lolcats had been mentioned on a message board I frequent. I think neko can look very nice in business wear. Recently, the commander of the Gunbunnies, Oolon Sputnik stated that he would step down and asked for volunteers to take over for him. I offered to do so, but only if no one else did. Guess who got the job.....that's right, me. So now I'm the commanding officer (colonel)of the Gunbunnies. It's my job to organize events, and you know, do stuff. Well, one of the things I thought of doing was doing some kind of Trooping the Colour like they do in the UK on the Queen's birthday. Well for that, I'd need a proper officer style horse, to look impressive on while I carry a flag/banner. But as a Gunbunny, I'm a tiny penguin and I didn't know if they made horses for Tinys. But in SL you can find anything, and yes, that means horses for tinys. Cute lil' ponies, actually. They even come in pink! Although I did say in the Caledon group chat: "I don't think a penguin colonel would ride a pink pony no matter how cute and adorable it was." So I settled for traditional white. 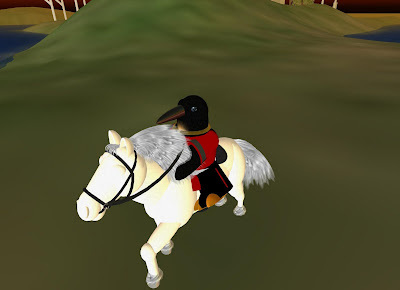 Here I am, Colonel CronoCloud Creeggan of the Caledon Gunbunnies riding her great white pony, Stallman. Yes, I named the pony after Richard M. Stallman, pony's live in "stalls" and I do run GNU/Linux (though I just call it Linux) Hi ho, Stallman! I acquired my pony from Lilliput in Heron Shire 215, 215, 21. It was only 550L$ and it even works with the Cavalry HUD sold at The Coaching House (right near the Caledon Eyre telehub)owned by Virrginia Tombola. Making books in SL the easy way. The THiNC Printing Press & Book only uses textures or snapshots to display pages. By using your favorite paint program you can put text into a picture format supported by Second Life to upload. Currently I find the easiest way to incorporate text & pictures is using Microsoft Publisher and save it as a jpeg. A free publishing program which I haven't used alot called Scribus, it can export to jpeg and it is available in all flavors. (Mac, Windows, & Linux). There is also a printer driver for windows users that can save each page as a bmp. (Recomend bmp, the jpeg optiond didn't work for me.) It's available here: http://sourceforge.net/projects/imageprinter/, only con is it makes large image files. You don't have any control on what sizes it makes. Typing text into your image program? Cludgy. Scribus is a nice open source desktop publishing app, but why not use your usual wordprocessor or desktop publishing application, or even LaTeX. But now you're thinking, but CC, how do I get the output of those into my SL "book". PDF. SL can't import it directly, but it is easy to take a PDF and turn it into a series of images in any format you want, but you'll need the tools to do so. First your program should output PDF somehow. On the Unixy type operationg systems (Linux, OSX, the BSD's, etc), that's easy, their printing systems are Postscript based and the option to print a file as PDF is often a standard GUI option. And even if it isn't, it's a simple command on the command line away to convert the Postscript output to PDF. On Windows it's not so easy, PDF output support is not built in. But you can download virtual PDF printer you can print to, most of which are actually frontends to the Ghostscript software that provides the Unix type OS"s their PDF making abilities. PDFCreator or CutePDF are often recommended. Once you have PDF (or Postscript since you can convert PS to images too) you use whatever tools you have to convert PDF to your image format. ImageMagick suite's convert tool can convert PDF into practically any format, including the formats preferred by SL. OSX users can do the same or similar. You Windows users....well you've got tons of shareware/freeware/nagware/adware stuff to pick from, none of which I'd trust as much as the Unixy tools. I'd try ImageMagick's suite's command line "convert" tool, you'll still need Ghostscript installed. You'll simply do a convert.exe foo.pdf foo.jpg (or foo.png, foo.tga foo.bmp etc.) You'll get a jpeg of every page as output. Enjoy.